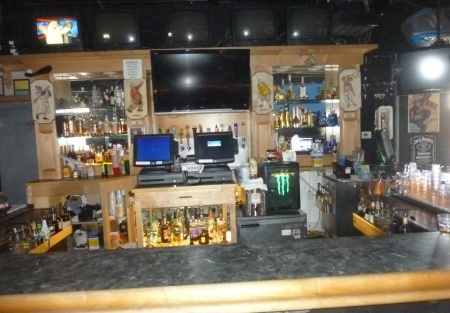 Here is a very popular local bar and grill located in the heart of a bar and grill loving community. You can't go wrong here. The place is standing room only on weekends and during the many community sponsored special events that go on through out the year. Drop by and see all the money flowing through here and the potential for even more. Games alone bring in big money. Bands play on Thursdays and Sundays and a very popular DJ keeps the dance floor and bar full on Friday and Saturday. Pool tournaments, Karaoke it's all here. Huge opportunity for an existing club operator or anyone with a desire to run your own successful club. Location has great signage and with the pop up windows facing the main drag through town it promotes itself. This place has it all, from the bustling kitchen serving up great food to the great bar and seating areas, success is practically assured. Fun friendly bartenders, fast service, great decor scheme all in the safe and trouble free environment that the doormen provide. Liquor license has no violations and the place is well received by the local authorities. The space is approximately 3400 square feet with an enclosed patio area of approximately 800 square feet. There is also a large area open field area connected to the property for outside special events that is just waiting to be capitalized upon. They have lots of cold/dry storage and a large office big enough to catch a little sleep in after a long night of counting your money. Rent for all of this is approximately $35000 per month. Current eight year term expires in June of 2013 with another eight year option available. Lots of seating, large overall capacity, great set up and a huge opportunity for even greater success than the current owner is experiencing awaits you, are you ready? let the bands play on!